Passwords stored in the passwords file of Chrome Web browser ('Login Data' file in the profile of Chrome). Added 'Display Encrypted Data In Lower Pane' option. Decrypt data of the current system and user - In this mode you don't need to provide the logon password of the user or any other information, but you may need to run DataProtectionDecryptor as administrator. Decrypt data of another system or another user on your current system - In this mode you have to provide the path of Registry files and the Protect folders of Windows, and you may also need to provide the logon password of the user if the password was used to decrypt the data. After you run DataProtectionDecryptor.exe, the 'DPAPI Decryption Options' window is displayed. You can also open this window by pressing F9. Choose the 'Decryption Mode'. If the DPAPI data was encrypted on your own computer with your current user, choose the 'Decrypt DPAPI data from current system and current user' option. If you want to decrypt DPAPI data created on another system stored on external drive, choose the 'Decrypt DPAPI data from external drive or another user' option. If you selected the external drive decryption mode: Choose the root folder of your external drive, click the 'Automatic Fill' button and the other fields (Protect Folders, Registry Hives Folder) will be filled for you. You can also manually fill these fields with the correct folders. If the DPAPI data was encrypted with the logon password, you have to enter this password in the 'Windows Login Password' field. Decrypt DPAPI data stored in the specified file or files: If you choose this option, you can specify any file that contains the DPAPI encrypted data as binary data or as text. Examples for files that you can specify: Windows Registry hives (ntuser.dat, SOFTWARE file in C:\windows\system32\config), .reg files exported from the Registry, Windows Credentials files, Wireless network key files (stored in C:\ProgramData\Microsoft\Wlansvc\Profiles\Interfaces ), cookies and passwords file of Chrome Web browser. You can also paste the text from .reg file of Windows that contains the DPAPI encrypted data. Optional Entropy: You should use this option only if the DPAPI data is encrypted with additional key. You can specify the key in hexadecimal format (e.g: 2A 3D B8 C9...) , as ANSI string or as Unicode string. After filling all needed fields in the 'DPAPI Decryption Options' window, press the 'Ok' button and DataProtectionDecryptor will start decrypting the DPAPI and display the result on the main window. 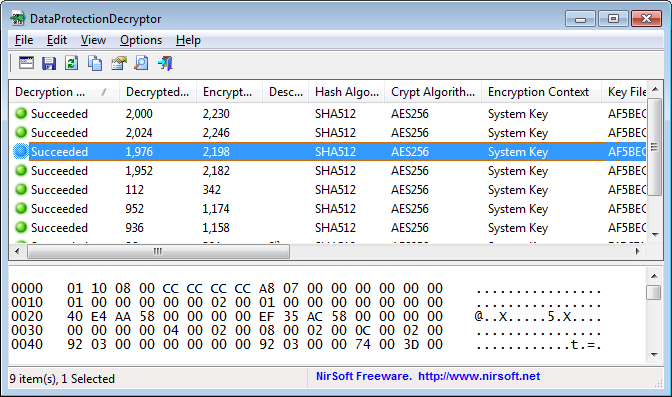 Key Filename: Specifies the key filename that was used for encryption (Located in the 'Protect' folder). If you try to decrypt DPAPI data on your current running system, try to run DataProtectionDecryptor as administrator by pressing Ctrl+F11. If the decryption still fails, you can also try to turn on the following option: 'Try to decrypt the data by executing code inside lsass.exe process (Requires elevation)'. For using this option on 64-bit systems, you must use the 64-bit version of DataProtectionDecryptor. Verify that all folders specified in the 'DPAPI Decryption Options' window are correct and you have read permission for these folders. if the 'Key Encrypted With' value is 'User SID+Login Password', verify that you type the correct login password of the user on the external system. After you finish the translation, Run DataProtectionDecryptor, and all translated strings will be loaded from the language file. DataProtectionDecryptor is also available in other languages. In order to change the language of DataProtectionDecryptor, download the appropriate language zip file, extract the 'dataprotectiondecryptor_lng.ini', and put it in the same folder that you Installed DataProtectionDecryptor utility.